Although many think that Siberian and Bengal tigers have their own species, they are actually subspecies of the Panthera Tigris. These tigers both eat some of the same animals and can eat a very large amount of meat each day. It would take humans weeks to consume the amount of food that they do per day. Both of these tigers are very beautiful and have different colors and shades. One interesting notion is that they both have stripes on them and both are huge cats that pounce on their prey instead of chasing it. Although these beautiful tigers look slightly the same to one another and are mistaken for the same, you can tell which is which by their location. This is one of the main and key differences between the two. Bengal Tigers can be found in India as well as Burma and Bangladesh. On the other hand Siberian Tigers can be found mostly in Russia now, and a few in China and Korea. The reason North Korea ad China don’t have as many anymore is because they are being killed by illegal poachers. The habits of these two beautiful creatures are somewhat the same and yet very different. One thing we will discuss is their eating habits. Both of these tigers eat a large amount of meat a day and Siberians in particular can consume up to 200 pounds in one day. They both eat animals like pigs and deer, amongst other things. Siberian tigers will kill bears when they can’t find their normal food, usually brown bears. Bengal Tigers like to stay in the brush, tropical jungles and tall grasses. Siberian tigers enjoy being alone and mark their territory using their pee or scratches and also cover a huge territory of almost 400 acres. These tigers are in serious trouble of becoming extinct. Not only is there a small number of these two tigers left, but they are also being shot down and poached for their fats, furs and bones to make Chinese medicine. Siberian Tigers are thought or assumed to only exist in numbers of about 400 in the wild and only a mere 500 that are held captive in zoos and such. Bengal Tigers, on the other hand, are also endangered and there are known to be about 3,000 tigers or so left. This means that shortly both species of tigers are set to disappear forever in relatively short span of time if nothing is done to save them from extinction. Both of these tigers consume a lot of meat each day, sometimes reaching 200 pounds of meat a day. They both also commonly eat pigs and deer an avoid contact with humans. 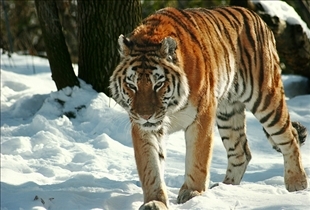 Siberian Tigers are mainly in Russia, with a few in China and North Korea. Bengal Tigers on the other hand are in India as well as Bangladesh. These two tigers are beautiful creatures that are facing extinction if we don’t act fast and protect them. Which type of big cat is biggest? Amur tigers are the subspecies of the largest tiger. Males can measure up to 3.3 meters 10 '9 "long and weigh up to 300kg £ 660. Females are smaller, measuring about 2.6 feet 8 1 / 2 feet from head to tail and weigh about 100-167 kg 200-370 pounds. Their orange coloring is paler than the color of other tigers. His bands are brown instead of black, and widely spaced. She has a chest white belly and a collar thick white fur around the neck. Bengal tigers average 2.9 feet 9 1 / 2 feet from head to tail and weighs about 220 kg of 480 pounds. Females are smaller, measuring about 2.5 meters to 8 meters long and weighs about 140 kg 300 pounds. 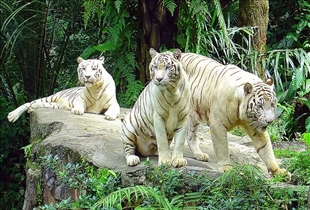 All white tigers are a color variation of the Bengal tiger, tigers have been reported he is white, with or without black stripes and tigers, which are black with white stripes or cats. Siberian tigers are larger, have thicker and lighter fur (not white, as some think), are more endangered, have a larger territory, avoid people when possible and their animals.